Facebook Badge does not Work? Facebook badge is what I wanted to put in place of static "About Me" provided by Blogger. The problem is, Facebook badge does not work! I hit the wall. Experimenting with the embed code provided by Facebook, I realized that badge.facebook.com does not work. It returns 302 (Moved Permanently), 301 (Moved Temporarely) or 400 (Bad request). Changing the CNAME from "badge" to "www" worked. 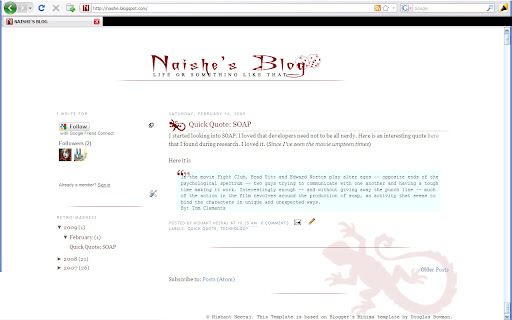 Dec 2008, I thought that I would upgrade my blog to look more genuine and not to look like one of the Blogger's standard template. Plus, I almost hated the top bar that includes search and next-blog button. But, it never happened -- in-fact, the idea to change the looks was too intense that I stopped blogging until I change it - a pseudo pressure. The reason was, I was too afraid to touch CSS and HTML tags were nightmares to me. Suddenly, in July 2009, one day I was caught in Catch-22. I had to design a web-page from scratch for our Muton site, and I realized probably the next good thing is vamping up my blog. 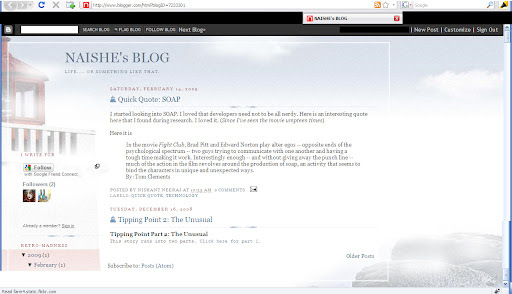 Played with CSS, HTML tags on N2O and pasted the CSS on this blog. Done! Phew! I changes the colors and looks from docile and goody-good to more declarative and rebellious. Hope you'd like it. Also, this is a pre-Google acquisition blog. So, does not have some of the hottest widgets and sharing capability. I am planning have all those badges, libraries, Tweet and share on Facebook very soon.